Zero-Oil Mint Chola Cornmeal Tarts are an entire Indian meal in a tart form. They are light, crispy, sweet, spicy, aromatic and basically filled with all better and healthier things.They are made in ZERO Oil. They are GLUTEN FREE and they can easily be made VEGAN too. 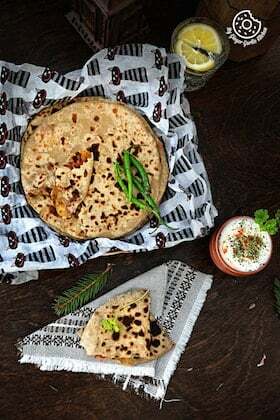 Full meal in a single tart: These tarts are full of tasty Indian meal in a tiny shell, or I would rather say this is an entire Indian meal in a tart. So, are you guys ready for some Zero-Oil Mint-Chola Cornmeal Tart. It has everything you need in a healthy and delicious meal: Is there anything which is stopping you from calling these tarts a super healthy meal in mini cup? If yes, then I will have to tell you why this is so good. – It has NO Oil. Yes, absolutely no oil, no butter, nothing greasy at all. – This is GLUTEN FREE too. And that’s why it’s making me super excited to tell you about them. Filled with nutrients: Are we ready to talk about my serious love for these tarts? I mean, they’re my favorites. They are light, crispy, sweet, spicy, aromatic and basically filled with all better and healthier things. Make it on Friday to enjoy throughout the weekend: OMG these tarts! I was quite excited about them. I made these tarts last weekend, when I had a sudden craving of having an Indian meal in a form of tart. Yes, you heard me right. Now let’s talk about the tarts themselves. 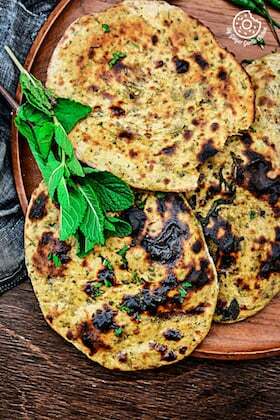 Flatbread = Tart: The tart base is the replacement for an Indian flatbread. One of the best things about this tart is its base. 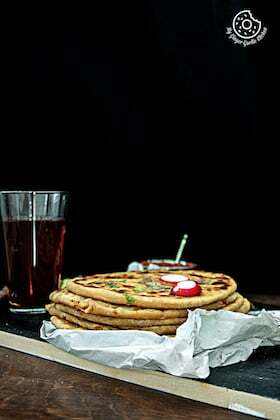 It is nothing fancy, but the good-old makki ki roti (cornmeal flatbread) in the form of tart. Curry = Stuffing: Another great thing is that curry part; this is packed to the brim with veggies, beans, spices and herbs. I’m talking about chickpeas, mint, onion, chili, garlic, tomatoes, ginger, chili, sugar, etc. So many different ingredients, and yet super good! This filling is super refreshing, aromatic and mouth-watering because of the presence of spices and mint. You can use pre-cooked chickpeas or canned chickpeas. Either way, the chola aka chickpeas would come out super intriguing. Raita is icing on the cake: And there’s also a final touchup of herbed greek yogurt. A dollop of this yoghurt is the replacement of raita, which you add at the end. This addition makes this entire dish so bright and more desirable. I have to say, it goes so perfectly well with spicy chickpeas, like some raita accompanying the spicy curry and flatbread. And lastly, add some fresh onions and mint leaves. Now your full Indian meal in a form of tart is ready to be consumed. I know, I know, that sounds a lot, but it isn’t. They all are the best matches made in heaven. Quick, easy and filler: What I love most about these tarts is that the recipe is so easy and filler at the same time. You can really make them quickly and enjoy them all weekend. Just pop your tart-shells few minutes in oven before re-using them, reheat curry and they are good to eat. I am using chickpeas for this recipe, because that’s my personal favorite. But you can use any of your other favorite beans. Chili is essential: The awesome flavour makes it perfect for family eating. If you do not like so much hotness, then add less chili. But don’t completely omit it because that’s an essential part of majority of Indian meals. Zero-Oil Mint-Chola Cornmeal Tarts are an entire Indian meal in a tart form. They are light, crispy, sweet, spicy, aromatic and basically filled with all better and healthier things.They are made in ZERO Oil. They are GLUTEN FREE and they can be made VEGAN too. 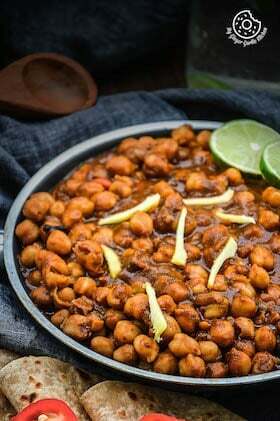 Add mint leaves, ginger, garlic, tomato, green chilies, onion, dried mango powder, chili powder, chana masala, salt to taste, garam masala powder, water to a food processor and grind well into a smooth paste. Heat a non-stick pan on a medium heat. Add mint paste, and cooked chola. Mix well and cook covered for 15 minutes while stirring occasionally. Add tamarind puree, salt, sugar and kasuri methi. Mix well and cook for 5 minutes. Remove from heat and set aside. In a small bowl, whisk all ingredients together. Taste and adjust the seasoning. Add salt to the cornmeal and mix well. Add warm water and knead well to make a medium soft dough. Divide the into 10-12 lemon sized balls. flatten ball and place into a tart pan, pressing in gently. Generously prick crusts with fork. Bake in 180°C preheated the oven for 25 to 30 minutes or until they turn very light golden brown. Remove from pan; let them cool. Fill tart shells with chickpea curry and top a dollop of herbed yogurt. Sprinkle some onions and garnish with a mint leave. If you like this then you will these other tarts too.